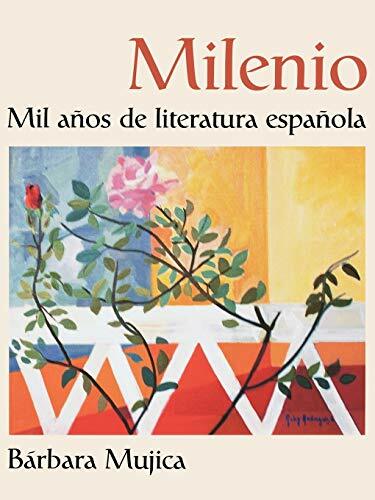 Appropriate for a one or two semester survey course at the fifth semester or beyond-ideal for majors, minors, and even non-majors, Milenio provides a survey of Spanish literature from its origins to the present. Most selections are excerpts from longer works, although all function as independent units. Milenio features a number of complete stories, essays, poems and one-act plays. Selections are ample enough to give students an idea of the author's writing, yet short enough to be treated in one or two class periods. Milenio provides enough selections to allow instructors to pick and choose according to their own preferences. Female authors include: Teresa de Ávila, Ana Caro, María de Zayas, Carmen Laforet, Ana María Matute, Soledad Puértolas, and Rosa Montero. In addition, Milenio contains Spanish works by regional writers such as Pere Gimferrer and Jon Juaristi. Milenio includes many tools that enable the student to read the selections with minimal difficulty. Each selection is followed by a list of Temas or review questions. Celebrate 1,000 years of Spanisb literary creativity! Bárbara Mujica's Milenio is a testament to the extraordinary vitality, creativity, and history of Spanish literature. From "El Cantar de Mio Cid" (one of the earliest examples of Spanish literature) to pieces by such modern masters as Juan Goytisolo, Eduardo Mendoza, and Rosa Montero, the text explores a wide range of selections that trace the development of Spanish literature from tis origins to the present day. Each Milenio selection was chosen for its literary merits, significance in the history of Spanish literature, and general appeal. The result is an outstanding collection, which includes a number of important women authors, such as the Cancionero poets, Teresa de Ávila, Ana Caro, and Soledad Puértolas, as well as works by regional authors, such as the Catalán poet Pere Gimferrer and the Basque poet Jon Juaristi. Introductory Essays, at the opening of each chapter, which highlight important information about the historical and literary movements covered in the chapter. Footnotes, which clarify difficult words, constructions, and geographical and historical terms. Glossary of literary terms, including names of movements, theories, rhetorical devices, poetic meters, locutions, and more. Temas or questions for conversation, which encourage analysis, interpretation, and personal reaction. Sumario at the end of chapter, which outlines themes for conversation, oral reports, and composition. Lecturas suplementarias, a selected bibliography for readers embarking on their own research. Barbara Mujica is an American novelist, short story writer and critic. She has also written op-eds on bilingual education and is a member of the advisory board of the US English association; her husband Mauro Mujica is its Chair and CEO.